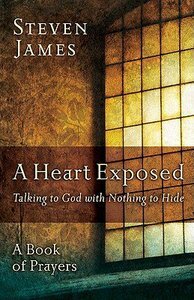 What if you talked to God like you talk to your friends?In A Heart Exposed, Steven James presents an original collection of image-rich prayers that reflect a heart laid bare before God and invites you to speak to God with nothing to hide. If you want to be completely real with God, these prayers will pave the way for a life of honest, soulful communication with the God who is always waiting, always available, always listening. "Steven James exposes his heart in these beautiful, raw, and tender prayers. Prepare to weep, to worship, and to communicate with God in a fresh new way as you read." --Michelle Cox, author, Simple Little Words and Mothers Who Made a Difference"With raw emotion and melodic prose, Steven James paints a compelling portrait of sin and grace; desire and sacrifice; conviction, confession, and love." --Vonda Skelton, speaker and author, Seeing Through the Lies"A truly unique and creative offering. Honest, worshipful, grand, and real, A Heart Exposed has become a favorite. I've never read anything quite like it." --Rick Altizer, singer, songwriter, and producer in Nashville, TennesseeCritically acclaimed author Steven James has written more than twenty books, including the bestselling thriller series The Bowers Files. One of the nation's most innovative storytellers, Steven developed his skill as a performer at East Tennessee State University (MA in storytelling). He lives in Tennessee with his wife and three daughters. - Publisher The prayers of the people in Scripture contain everything from powerful stories of deliverance and explosions of heartfelt praise to desperate cries for mercy and incisive observations about the injustices of life. In the Psalms alone we find both complaints and outbursts of amazement along with whispered pleas that throb with grief and pain. Why then do our prayers today often seem so bland in comparison? What would happen if we, too, started praying honest prayers, raw with the realities of life, tender with the realization of grace? In A Heart Exposed, Steven James presents a collection of image-rich prayers that do just that--some etched out of the granite of suffering, others polished by the beauty of praise. All reflect a heart laid bare before God and invite readers to do the same. The prayers of the people in Scripture contain everything from powerful stories of deliverance and explosions of heartfelt praise to desperate cries for mercy and incisive observations about the injustices of life. In the Psalms alone we find both complaints and outbursts of amazement along with whispered pleas that throb with grief and pain.